All "to go" orders are subject to a $.35 fee per item ordered. Loaded baked potatoes are rolled in panko bread crumbs & fried. Served with ranch. Crispy potato skins topped with melted cheese, crisp bacon bits & chives. Crispy tortillas covered with chicken, hot pepper cheese ,and jalapenos. Served with our fresh homemade salsa. Breaded in house, fried zucchini strips. Served with ranch. Mushrooms breaded and deep fried golden brown. Served with ranch. Not too thick or too thin, just perfectly crisp and delicious. Onions are thinly sliced, breaded, and fried. Served with ranch. No imitations here. Genuine Idaho potatoes. Pickle spears breaded and deep fried to a golden perfection. Served with ranch. Fresh tortilla chips, seasoned ground beef, chicken, lettuce, sour cream, tomato, red onion, chives and melted cheese. Served with our homemade salsa and jalapenos on the side. Lightly breaded mozzarella. Served with marinara sauce. Lightly dusted with cinnamon & sugar. Melted cheese, buffalo sauce & chicken. Served with tortilla chips. Parmesan, spinach, Swiss & cream cheese with a bowl of fresh tortilla chips. ​Served with our homemade salsa. A tasty combination of livers and gizzards. Served with chicken gravy. Chicken tenders, breaded in house, fried. Served with fries and ranch. 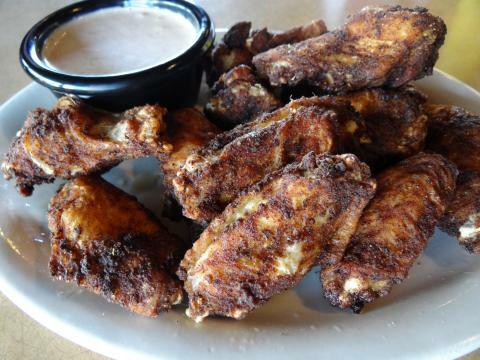 Blackened with Cajun-style seasoning, deep fried and crispy. Served with Santa Fe ranch. One pound of wings breaded in house & fried. 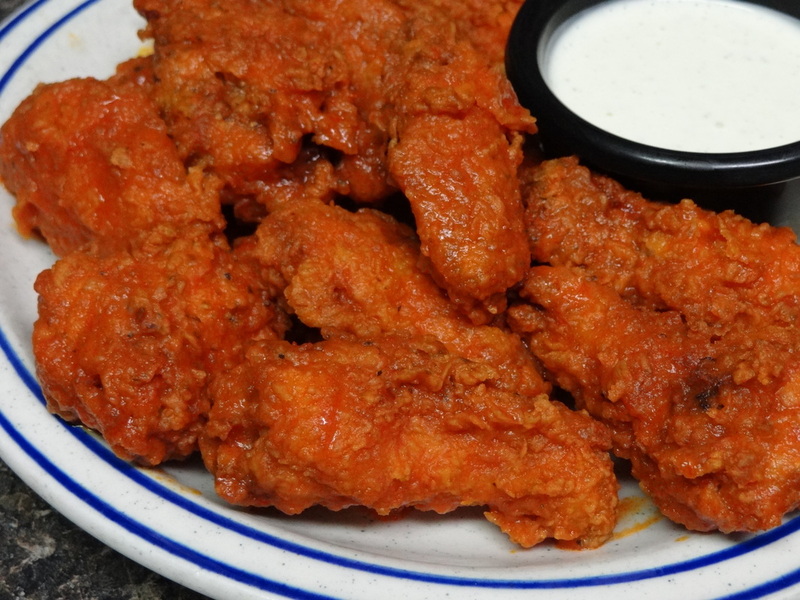 One pound of wings breaded, fried & dipped in our hot sauce. Your Choice, both are breaded and fried to golden perfection. Served with chicken gravy. Romaine lettuce topped with charbroiled chicken breast, Parmesan cheese, red onion, croutons and Caesar dressing. Served with garlic toast. Crisp iceberg lettuce with red and yellow grape tomatoes, bacon, bleu cheese crumbles & topped with fried onion strings. 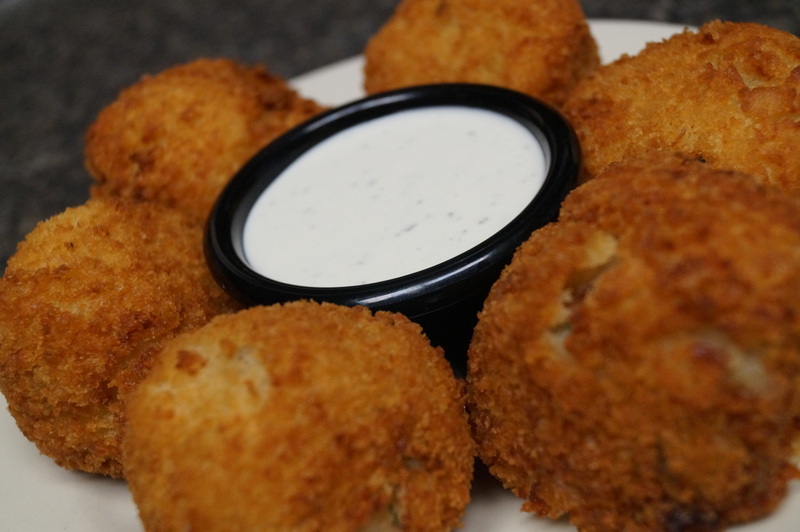 Served with our homemade bleu cheese dressing. Mixed greens, grilled chicken breast, bacon, avocado, tomato, cheese, and pecans. Served with warm honey dijon dressing and a muffin. Mixed greens, tomatoes, mushrooms, avocado, spicy cheese, croutons, and cajun seasoned chicken breast. 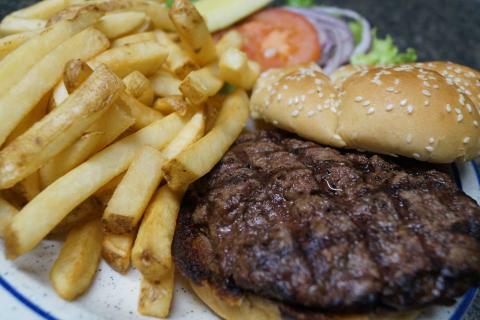 Served with our homemade Santa Fe ranch dressing and muffin. Mixed greens, ham, turkey, American, Swiss, cucumbers, tomatoes, egg & croutons. Served with your choice of dressing and muffin. Mixed greens, tomatoes, cheese, cucumber, and croutons. Served with your choice of dressing. Mixed greens, avocado, egg, bacon, tomato, cucumber, fried chicken breast and croutons. Served with your choice of dressing and homemade muffin. Homemade & loaded with crab meat. Served with lemon aioli. Crispy slaw has cabbage, red pepper, edamame, carrots, mango, toasted almonds, citrus vinaigrette & fried onion strings. Grilled tilapia soft shell tacos (3), pico de gallo, cabbage & baja sauce. 3 Soft-shall tacos, filled with homemade smoked pork, lettuce, pico de gallo, and avocado. Served with salsa on the side. Traditional Mac & Cheese, topped with homemade smoked pork, pico de gallo, and BBQ sauce. Traditional Mac & Cheese, topped with our Three Meat Chili. 8oz McGonigles lean ground beef burgers charbroiled to order. Crispy Bacon tops fresh sharp cheddar cheese to classify this burger as a favorite. Coach's charbroiled burger on swirled rye bread with Swiss cheese, grilled onions. 1000 island dressing on the side. Cream Cheese and Grilled onions. This burger is piled high with cheddar cheese and Coach's chili. Melted Blue cheese crumbles smothering our famous Coach's burger. Monterey jack cheese and fresh avocado. American cheese, guacamole, diced tomatoes and a side of jalapenos. Crispy bacon, grilled pineapple and Swiss cheese. Grilled, boneless, marinated chicken breast. 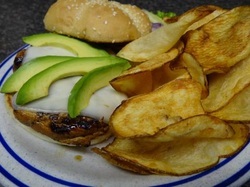 Monterey jack cheese and fresh avocado served atop our Coach's grilled chicken breast. American cheese, guacamole, diced tomatoes. Mayo and jalapenos on the side. Crispy bacon, grilled pineapple and Swiss cheese. Mayo on the side. Sauteed mushrooms and Swiss cheese. Mayo on the side. Grilled chicken breast topped with sauteed mushrooms, green peppers, onions, Swiss and American cheese. Mayo on the side. Cajun grilled chicken rolled in a flour tortilla with lettuce, tomato, spicy cheese, and guacamole. Served with our homemade Santa Fe ranch. The finest marinated and grilled chicken breast. Mayo on the side. Crispy Chicken fried to perfection. Mayo on the side. Roasted red peppers, zucchini, yellow squash, onions, smoked gouda, lemon aioli. Served on a whole wheat ciabatta bun. Crispy Chicken Breast dipped in our famous hot sauce, topped with jalapeno cheese. Served on a toasted bun. Ranch on the side. 1/4 lb of fresh pork tenderloin breaded and deep fried to perfection. Served with Coach's secret sauce on the side. A true classic on sourdough bread with ham, turkey, Swiss, American, lettuce, tomato and bacon. Mayo on the side. A double-decker with corned beef, sauerkraut and Swiss cheese on swirled rye bread. Homemade 1000 Island dressing on the side. American & Swiss Cheese on toasted sourdough bread. Smoked bacon, lettuce, tomatoes, and American cheese, on toasted sourdough. Three meat & three bean thick chili. Crispy chicken, buffalo sauce, lettuce, tomato & bleu cheese crumbles. Smoked pulled pork, ham, homemade pickles and Swiss on a grilled ciabatta bun. Ham and Swiss cheese on toasted sourdough bread. Mayo on the side. Choose from a hamburger, cheeseburger, grilled cheese, hot dog, cheese quesadilla, mini corn dogs, taco's or a PB&J sandwich. 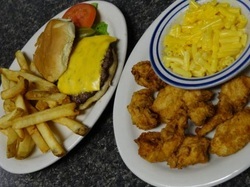 Side the choices include our homemade chips, fries, apple sauce, fresh fruit or mac 'n' cheese. Our Kansas City location (103rd & Wornall) proudly serves cakes from Three Women & an Oven. Our rotating selections include flavors such as carrot, chocolate kahlua, Italian wedding, chocolate strawberry, key lime, lemon, chocolate torte and other seasonal flavors. Definitely worth saving room or taking a slice to go. 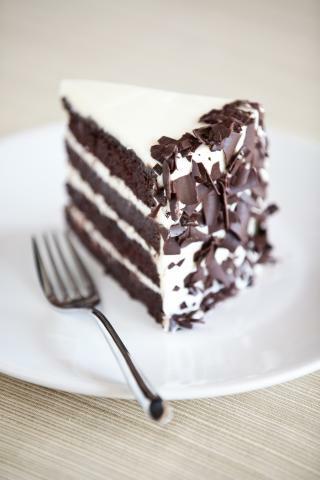 Our Overland Park location (135th & Antioch) proudly serves cakes from Dolce Bakery. Selections rotate weekly, worth stopping by to see what new treat we have in store, some of the favorites include: carrot, chocolate with butter cream frosting, raspberry cream, peanut butter & chocolate along with other seasonal flavors.